Now the mother of two young girls, the wife of a nature photographer, and the maker of jams and jellies, Helena and her family are leading an ordinary life in the U.P., as Michiganders call the remote Upper Peninsula. While heading down a country road toward home to meet her older daughter’s school bus, Helena’s car radio blares the news that her father, Jacob Holbrook, the Marsh King, has escaped from a maximum security prison just thirty miles from her home after killing two guards. Helena loved her father. “The Jacob Holbrook I knew was smart, funny, patient, and kind. He took care of me, fed and clothed me, taught me everything I needed to know not only to survive in the marsh, but to thrive.” She hadn’t attended his trial or had any contact with him in thirteen years. She’d changed her name and even her husband didn’t know of her past. Now, all that will change and Helena feels that she’s the only one who knows enough about her father to find him and stop him from what surely are plans to harm her and her family so she sets off into the wilderness to use the hunting and tracking abilities her father taught her. Helena’s powerful first-person narrative weaves the world of her childhood with that of her quest to find her escaped father. Helena immerses the reader into the world where she survived in part because of her imagination which allowed her to create a space conjured from the pages of old National Geographic magazines. This novel will appeal to fans of Emma Donoghue’s Room as it explores the psychological aspects of the word “normal” and of what it means to love. While Karen Dionne’s prose is consistently mesmerizing, it is the inclusion of epigraphs from Hans Christian Andersen’s story “The Marsh King’s Daughter” that elevate the tale beyond the typical thriller. By choosing to share the fantasy of a wicked Marsh King, the fairy princess he captured, and their child Helga who is an ugly, yet kind toad at night and a beautiful, yet spiteful child by day, Dionne gives the novel a shimmering of fairy tale magic that makes the reader pause to consider the implications of Helena’s actions. Dionne paints such a visual portrait of the isolated land that is the Upper Peninsula that the topography becomes a character. Dionne’s personal experiences when she, her husband, and six-week-old daughter moved north to the U.P. in 1974 and spent three years homesteading without a phone or running water make the world she invents authentic. Every word of Helena’s adventures rings true. After you read the book, you’ll want to learn more about Dionne’s time in the U.P and this interview and pictures will feed your hunger for more of her story. I hope that librarians, teachers, and booksellers will recommend The Marsh King’s Daughter to older teens. The intrepid Helena is reminiscent of Bonnie Jo Campbell’s marvelous young heroine Margo in her Michigan tale, Once Upon a River. Rarely do female characters with grit and skill appear on the written page and having both set in the rarely visited landscape of rural Michigan is an uncommon bonus. 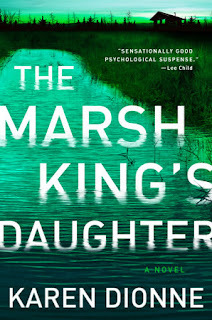 Summing It Up: Read The Marsh King’s Daughter to fall into a hypnotic story that will make you want to fly through the pages and that will force you to contemplate the nature of parenthood and love. This is the best psychological thriller I’ve read in quite a long time.